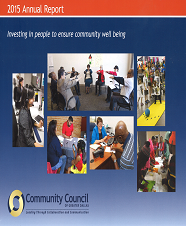 The Community Council of Greater Dallas Annual Reports. The Community Council of Greater Dallas Celebrates 70+ yrs. of Service. Since its founding in 1940, the Community Council has identified services that are needed in the community, assessed how best services could be delivered to meet social issues, and mobilized and implemented action plans working in concert with its member agencies and public sector resources. Pervasive issues over time have included juvenile delinquency and welfare; seniors; public health; daycare; and legislative advocacy. The Community Council met these challenges through fact-based research, deploying volunteers, incubating new services and agencies, expanding government programs where appropriate, convening collaborative work and delivering selected direct services.